The entry price of the popular Volkswagen Amarok V6 ute range will drop below $50,000 (plus on-road costs) when the manual version of the new ‘hose-out’ Core model launches in the second quarter of 2019. And not only will it be the only V6 dual-cab 4×4 ute in that price range and the only one with a manual gearbox, it will also boost its appeal among serious off-roaders by being the only Amarok V6 with low-range gearing. The only V6 rival for the Volkswagen Amarok is the Mercedes-Benz X-Class V6, which arrives later than expected in January and is now on sale from $73,270 in auto-only guise with low-range gearing. The Volkswagen Amarok V6 Core will also put the pressure on the four- and five-cylinder dual-cabs that keep creeping up in price. The new Toyota HiLux Rugged X starts at $61,990 and the updated Ranger Wildtrak at $63,990 (auto only). The Amarok V6 Core automatic arrives here first in late October, with pricing set to be just over $50,000. It makes do with an off-road mode and a locking rear diff for its permanent 4×4 system rather than low-range. The current entry to the Amarok V6 line-up is the Sportline auto priced at $55,990. The Core will be the only manual in the V6 line-up. In the Amarok four-cylinder range the auto commands a $2500 premium. “The Core V6 manual will be priced under $50,000,” a Volkswagen Australia spokesman confirmed to motoring.com.au. As announced at this week’s launch of the 200kW Volkswagen Amarok Ultimate 580, the Core V6 will come with the 180kW/550Nm version of the Amarok’s 3.0-litre V6 turbo-diesel mated to either the six-speed manual or eight-speed automatic transmissions. Standard equipment will include a cloth interior, rubber flooring, 17-inch alloy wheels, a multifunction steering wheel, single-zone air-con, front foglights, rear parking sensors, reversing camera, daytime running lights and Apple CarPlay and Android Auto. Like all Amaroks, it misses out on rear-side airbags and autonomous emergency braking. “At $50-something thousand we will launch an automatic Core with an eight-speed transmission — that’s an extremely good value way to get into that segment,” said Volkswagen Australia’s commercial vehicles director Carlos Santos. The Core follows the new flagship of the Amarok V6 range, the Ultimate 580, to market. But while the $71,990 Ultimate is slated to grab about 10 per cent of Amarok sales, the Core is expected to account for 15-20 per cent. 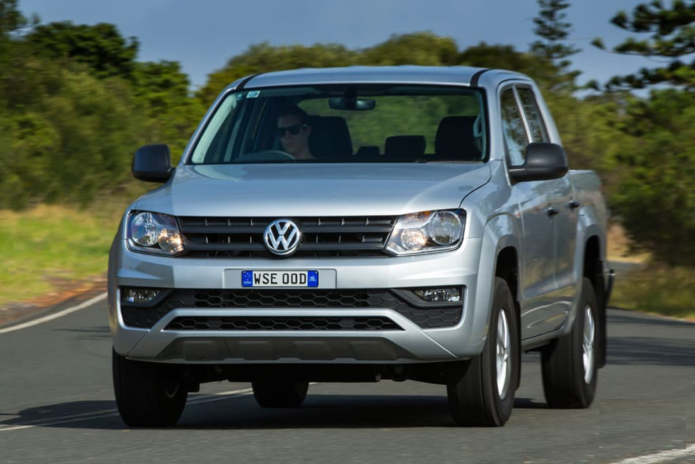 Both models will grow the proportion of V6 sales from around 70 per cent to 80 per cent of overall Amarok sales. While the Ultimate is heavier and has a lower payload than its 550 predecessor, the Core auto goes the other way. Its 2091kg unladen mass is 20kg less than the Sportline and its 989kg payload is 48kg better. Overall gross vehicle mass (3080kg) and gross combined mass (6000kg) is unchanged, as is the 3500kg braked towing capacity. That means it’s potentially the best load-hauler and tower in Volkswagen’s Amarok V6 range… until the Core manual comes along.